I recently got the chance to try out Lizi’s Granola in high protein and low-sugar varieties, and I am completely hooked! (Seriously, I had to put the bag away during my photoshoot because I kept eating the high protein one…) I put together a couple of recipes for you to show off the benefits of each mix – a protein-packed parfait and a naturally sweet smoothie bowl! This parfait is so simple you don’t even need a recipe! All you need is some fruit of your choice, your favourite plain yoghurt (I love Fage! 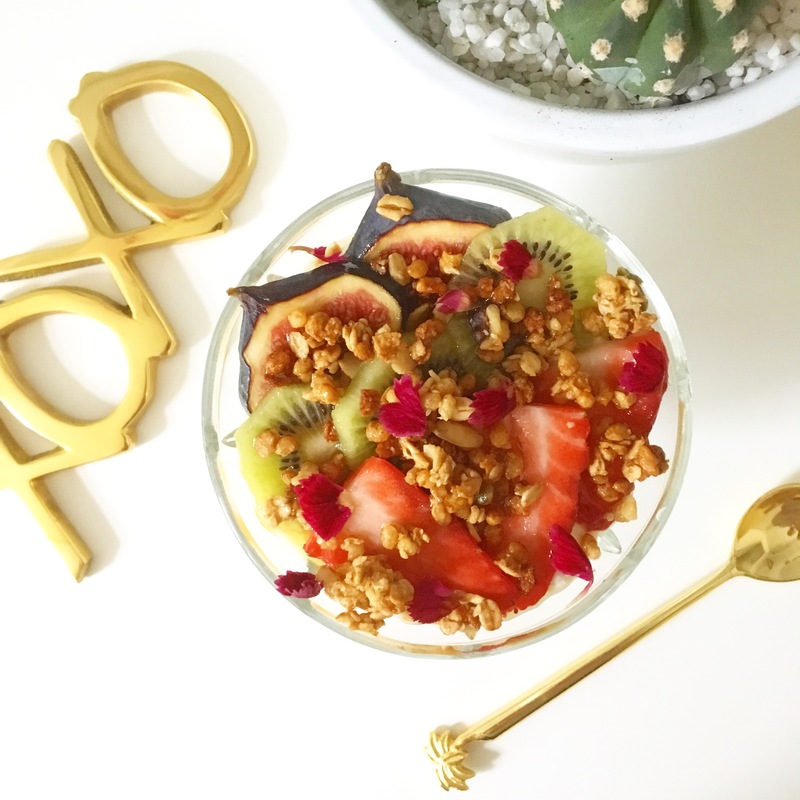 ), honey, and Lizi’s High Protein Granola. This is so good for you for breakfast because 50g of Lizi’s High Protein Granola contains 27% of your daily protein needs, so coupled with the naturally protein-packed yoghurt, makes an unbeatable combination. Protein is so important in a balanced diet because not only does it make you feel fuller for longer than fat or carbohydrates, but it also helps you build muscle. This is essential if you’re working out regularly to maintain fitness or lose weight. I’ve been addicted to this parfait for days now – the High-Protein Granola is so crispy and crunchy that it’s the perfect foil against the smooth and creamy yoghurt, and the tart sweetness of the fruit. My favourite combination is 50g of High Protein Granola combined with three large chopped strawberries, a drizzle of dark Greek honey, and three or four heaped tablespoons of Greek yoghurt. Simple and heavenly! Add in some edible flowers and you’ve got a breakfast that looks as good as it tastes… And, the great part is that the protein in Lizi’s High Protein Granola is vegetable based, which means this is suitable for vegetarians and vegans (simply use a sweetened, non-dairy based yoghurt in your parfait, and ditch the honey to make this completely vegan-friendly). If we’re talking eye-catching, though, you can’t get any more Insta-worthy than a smoothie bowl! I love to make mine with a bright green base to let my fruit really pop! Blend your frozen banana and spinach together. (I always have frozen banana in the freezer – just slice into coins and freeze in a single layer in a plastic bag!) Add your almond milk sparingly until the mixture is loose enough to spoon into a bowl – but don’t add too much liquid or your fruit will sink! Spoon your smoothie mix into a bowl, and sprinkle your granola on one side of the bowl. On the other side, decorate with your fruit, and edible flowers if you like! I love to slice and prepare a few varieties of fruit during the week, keeping them fresh in the fridge under some cling film, and using them up as I fancy. If you’re worried about using everything up, don’t forget you can add them into your smoothie blend as well as a topping. If you prefer a bright pinky purple smoothie base, replace the spinach with a handful of frozen blackberries! It really does make a big difference to how I feel when I make sure what I eat is good for me, and looks good too. If you don’t like to mess around in the mornings, you can prepare these the night before and just sprinkle your granola on top to keep it fresh. And obviously, you don’t need to eat these at breakfast either – very often I just have these for lunch at my desk… It’s definitely something to look forward to! Lizi’s Granola Range is available from Waitrose, Sainsbury’s, Tesco, Asda, Whole Foods, Co-Op, Booths and all good health stores, priced £3.89 (Low Sugar), and £3.99 (High Protein). Visit the website here. This is a sponsored post. I never write about anything I don’t like on Food Fash Fit, and all my sponsored posts are carefully selected so I can promote products I genuinely feel passionate about to my readers!